Oh yes, for fans of all things thrash – Fibbers MaGees on Parnell Street have you sorted. 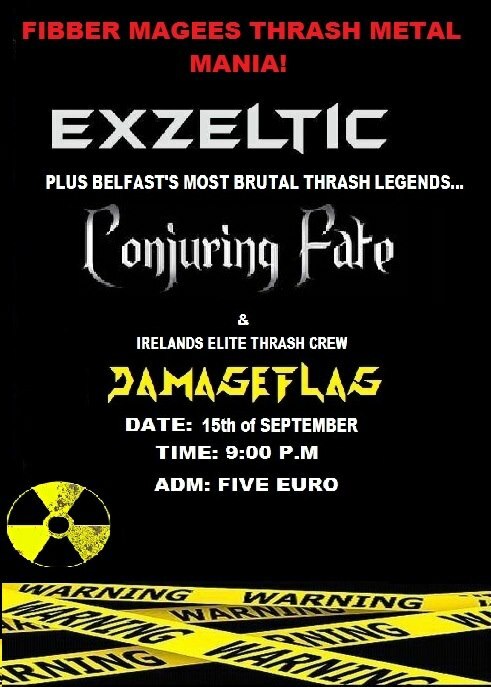 On Saturday, September 15th they’re holding THRASH METAL MANIA featuring Exzeltic (Tickets There’s current favourite Irish metal band), Conjuring Fate and Damageflag. €5 will get you in the door and knowing Fibbers there’ll be cheap drinks a plenty. Doors are at 9pm sharp. Exzeltic’s EP (Signs of Chaos) can be streamed in from YouTube and it’s well worth checking out. This entry was posted on September 4, 2012 at 4:55 pm and is filed under Gig Listing, Music with tags Conjuring Fate, Damageflag, Exzeltic, Fibber Magees thrash metal mania. You can follow any responses to this entry through the RSS 2.0 feed. You can leave a response, or trackback from your own site.